Even though I've graduated from backpacking to car camping with a queen-sized mattress and zip-together sleeping bags, nothing says summer like tent camping. And there is beaucoup beautiful camping to be had in the Northwest, from the beaches in the west to the Wallowas and Snake River in the east to the vast Gifford Pinchot in the north and the volcanic lakes in the south. Kicking off GSNW's new summer feature on great campgrounds and sites is the Trout Creek Campground in the Willamette National Forest. Just 19 miles east of Sweet Home, it has 24 sites ranged along the creek with access to the trails of the Menagerie Wilderness and the Old Santiam Wagon Road. 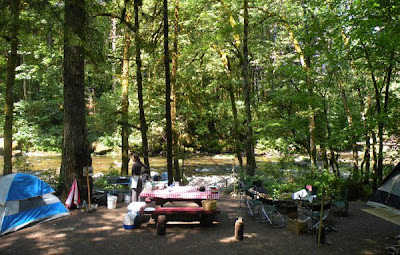 GSNW contributor Kim recommends "campsite #4 for its great beach and river access," as you can see from her photo, above. If you have recommendations (hopefully with photos) of your favorite campgrounds and sites in the Northwest, e-mail GSNW and I'll feature a few of the best this summer! Rhiannon, I'd love it! And glad you like it! Just wanted to say thanks for the site recommendation! My family camped at Trout Creek over Labor Day weekend & it was perfect. Thanks for the great advice! So glad you found it helpful, and most of all that you had a good time, Amy. Keep in touch if you find other gems!